When you’re busy in the kitchen this holiday season, make sure you don’t forget about your four-legged family members! 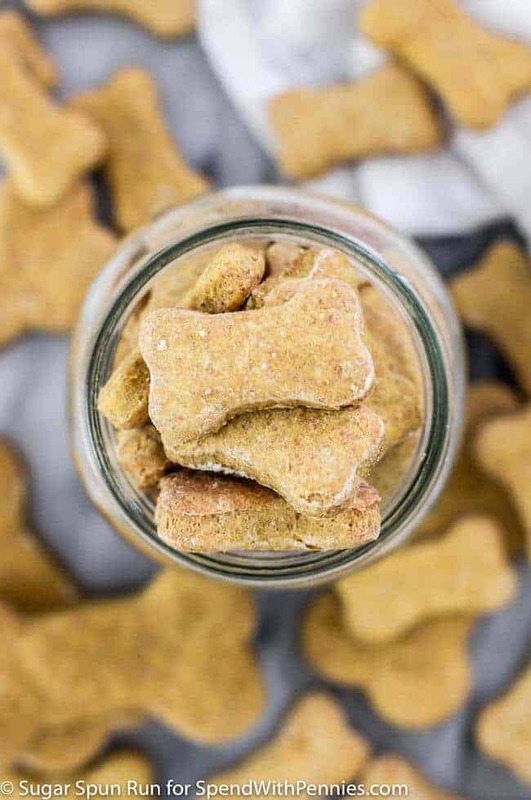 This Pumpkin Dog Treat recipe is easy to make with only 6 ingredients, and they are also a great way to use up any leftover pumpkin. Your dog will definitely thank you! 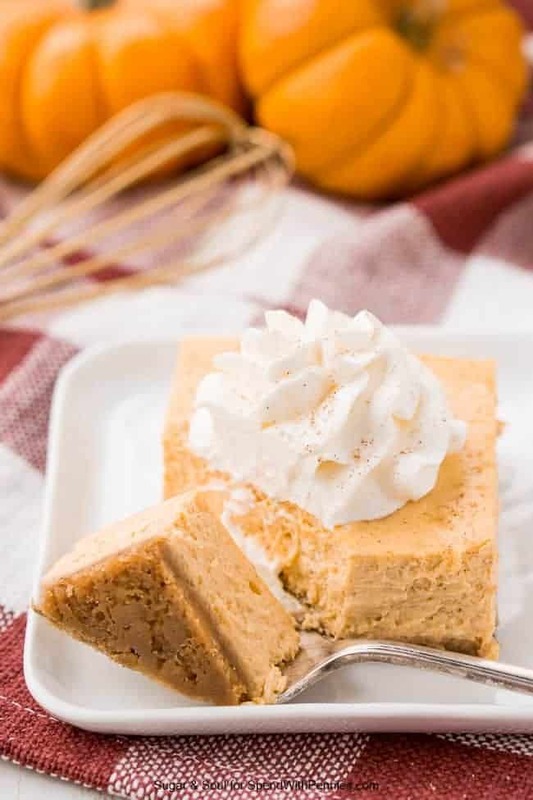 My kitchen is in a very busy state right now with a flurry of pumpkin recipes flying through. I have bought so many cans of pumpkin in the past few months that I alone may be largely responsible for keeping the pumpkin puree industry in business. The only problem with this is that, for a lot of my recipes, I don’t seem to end up using a whole entire can of pumpkin puree. Which means I have a lot of half-full cans that I don’t want to throw away, but am not entirely sure what to do with them. 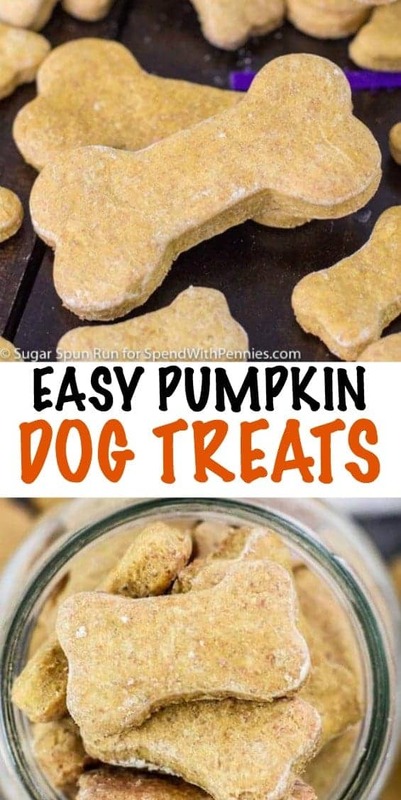 Well I’ve found the perfect solution to all of this leftover pumpkin puree — bake it into puppy cookies and feed them to your furry family members! 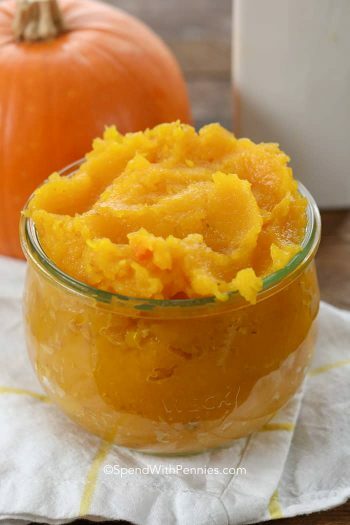 Pumpkin is a dog friendly ingredient that even can be good for their digestive tracts. I mixed this up with some other dog-safe ingredients including peanut butter (possibly my own dogs’ favorite flavor in the whole world), eggs, flour (I used a mix of whole wheat and all-purpose, though you can certainly use just one or the other), and just a little bit of baking powder. 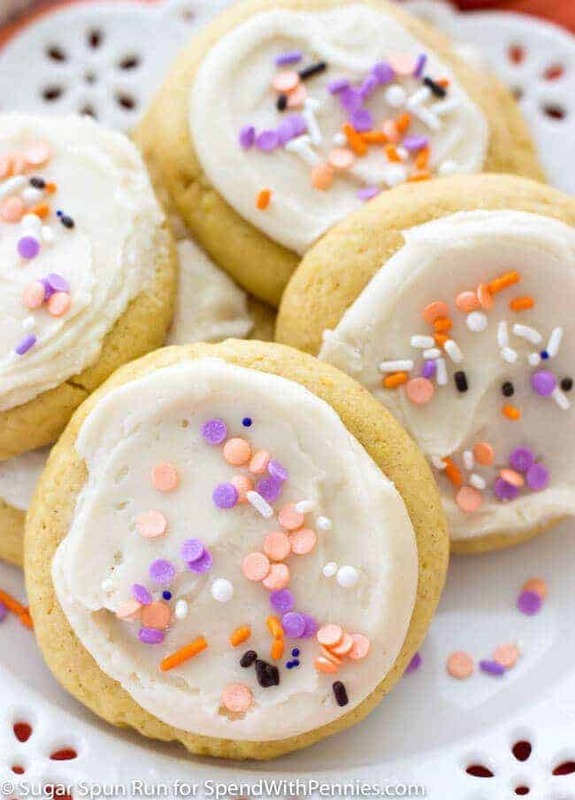 The dough is then rolled and cut out using cookie cutters — I used two different sizes of bone-shaped cookie cutters from Amazon, but you can use any shape! Because their texture is harder and crunchier than your average cookie, they take a little extra time in the oven, but mixing them up and cutting them out takes only minutes. 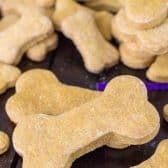 My dogs absolutely adored these pumpkin dog treats, and since they’re so easy to make, you can bet I’ll be making them over and over again! When you’re busy in the kitchen this holiday season, make sure you don’t forget about your four-legged family members! 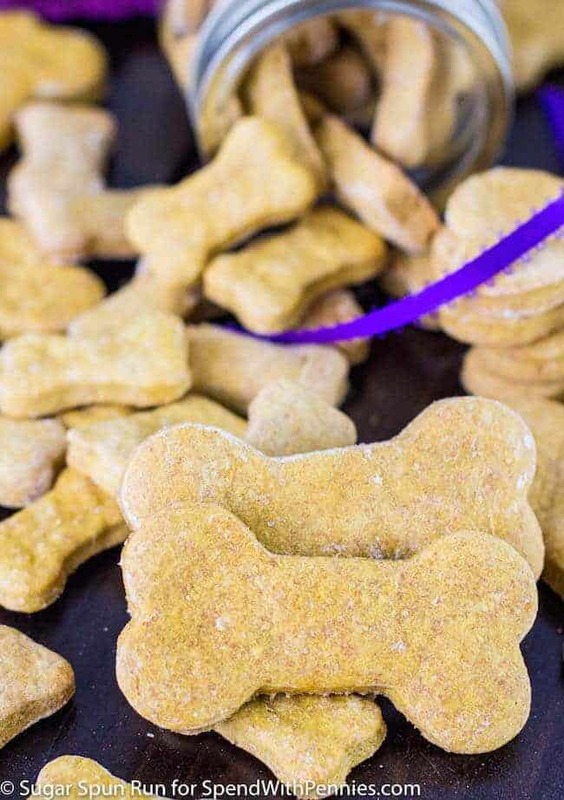 This Pumpkin Dog Treat recipe is easy to make with only 6 ingredients, and they are also a great way to use up any leftover pumpkin. Transfer dough to a lightly floured surface and roll out to approximately 1/4″ thickness. Use cookie cutters to cut shapes out of dough and transfer cut out cookies to prepared cookie sheet, placing at least 1″ apart. *Please double check the ingredients to ensure that the peanut butter does not contain xylitol, which can be toxic to dogs. Most peanut butters do not contain this, but always double-check the ingredient list just to be safe. 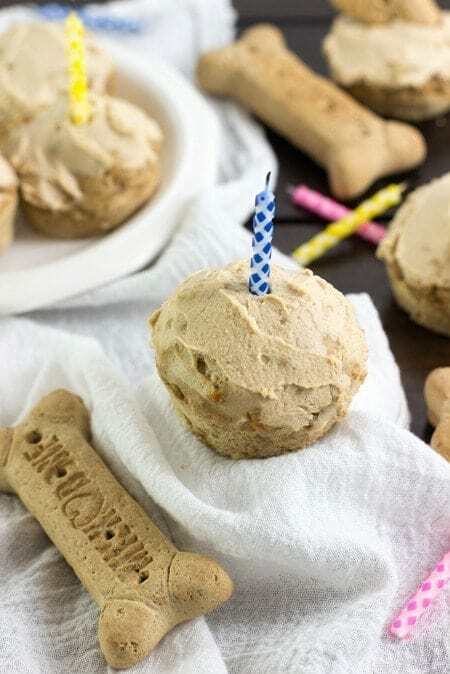 “Pupcakes” for your dog’s birthday! 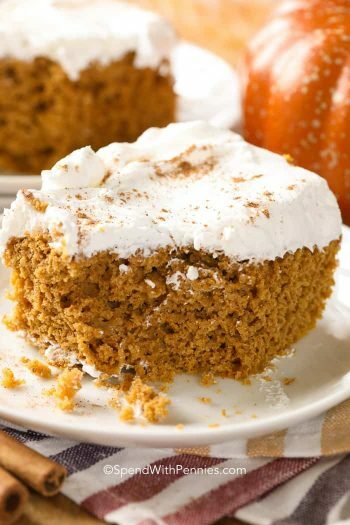 Here are some recipes for humans that use partial cans of pumpkin! 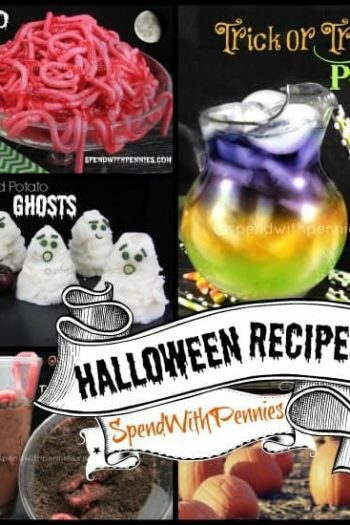 Recipes Tips and Great Ideas! I hate to ask about alterations to recipes but my dog gets pancreatitis pretty easily so I’m wondering if I could leave out the peanut butter, or use very little of it. Any suggestions as to how to tweak this a bit so he can still enjoy them? I’m not sure how they’d come out without all the peanut butter so that’s why I’m asking. Thanks so much! I have only tried the recipe as written, but other readers may have some ideas for you Alexis. I made lots of these. My puppy loves them and my friends’ puppies love them too so I have been sharing. My puppies love this recipe. So glad they loved it Suzette! 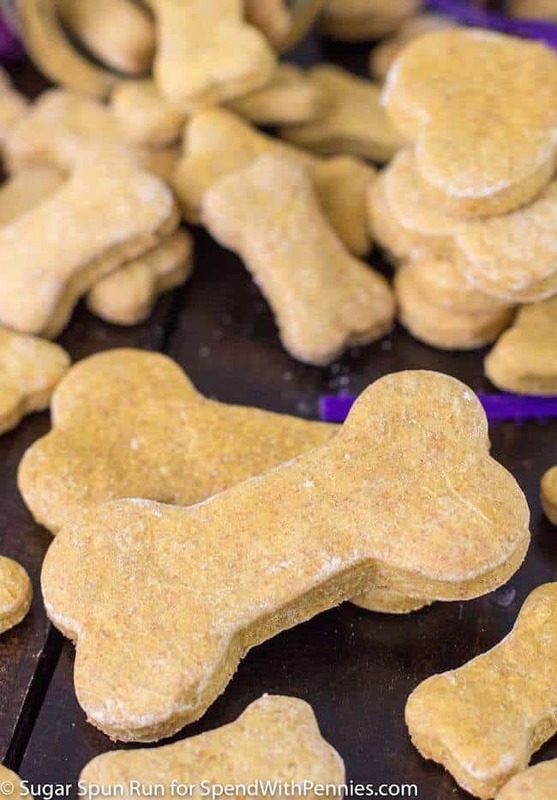 I made these dog treats and they look gorgeous! I love the beautification color they are from the pumpkin and the wonderful aroma from the peanut butter makes me want to try them! But I’m giving them as a gift and will restrain myself. I’m drying them a little further on 170° too hopefully make them a little harder. I hope I’m not stepping on my own toes by doing this outside the constraints of your recipe. If it works, I’ll let you know. Thank you Elizabeth!! Hope your dog loves them! I added just a little bit more peanut butter than the recipe calls for but oh my gosh, my dog will not stop staring at me to give him another one. They have all had 3 already!! This is a keeper. Thanks SO MUCH for sharing! I am glad he likes them Tracy! I just did two batches of these and am so grateful u had posted this recipe! Our dog loves them. So glad your dog loved them! Thank you! My 2 dogs LOVE these. I am so glad they love them Tessie! Can these be frozen to keep them longer? I’ve never tried freezing these, but I think that’d be just fine Christine! Our girls love them! Thanks for the recipe! You’re welcome, so glad they loved the treats Pam! My dogs love them . I find them easy to make . My three dogs LOVE these treats!! Thank you for sharing!!!! YAY, so glad the loved them Kim! Thanks for recipe. We adopted a dog that came to us looking pretty hungry. Then a month later had five puppies. We named the Momma Bella! I know she’s gonna love these treats! Let me know if you have other recipes. Aww! I am so glad Momma Bella liked these! I think my doggym kid and my friends may be getting these pumpkin peanut biscuits for Christmas :-). Thanks for the info and idea. Thanks friend! My dogs are going to love these so much!